The time machine of writing: "Humanless" cover is ready to be revealed! "Humanless" cover is ready to be revealed! 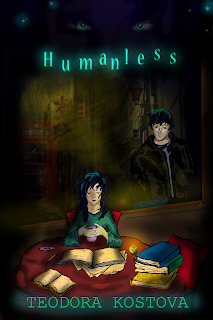 The cover for my YA novel "Humanless" is done and ready! It's been a long wait but it was totally worth it! The very talented artist Olga Zaharevici made the beautiful picture from scratch - she read the book, gave the idea for the cover scene and then hand-drew it. I love it - it's very old-school, so to speak. Hope everybody else loves it too. The artist did a wonderful job!